The Golden Club Cabanas is a lovely holiday resort located in the heart of the Rio Formosa Nature Reserve in Eastern Algarve region of Portugal. 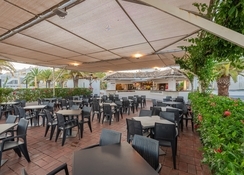 Close to the seaside Cabanas village and the coastal town of Tavira, this hotel features comfortable self-catering apartments overlooking the idyllic lagoon and a lovely white-sand beach. The Golden Club Cabanas accommodates its guests in studio rooms with a minimum occupancy of 2 adults as well as one-bedroom and two-bedroom suites that can sleep 4 adults. Breakfast, lunch and dinner – all buffet, would pamper your taste buds while you are enjoying a Portuguese Holiday. The hotel ensures entertainment and fun for all – sports activities tailored for your choice, multi-sport game court, kids’ playing area, children’s club and live evening performances and shows. You can hit the beach nearby or take a dip in one of the two outdoor swimming pools. There’s also an indoor heated pool with Jacuzzi, sauna and Turkish baths. 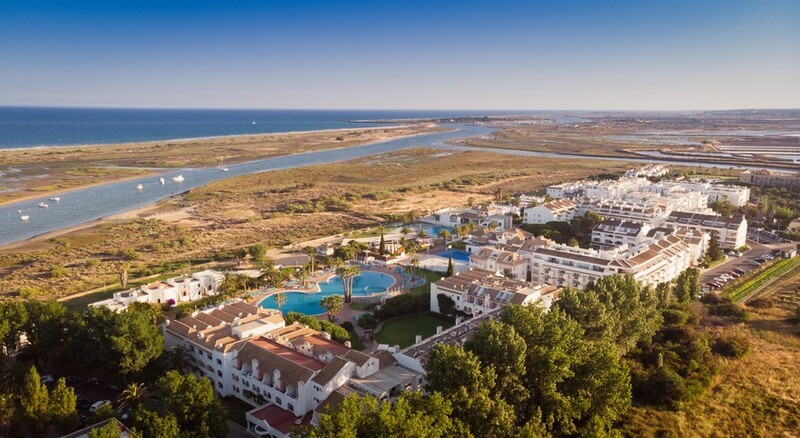 Golden Club Cabanas is one of the most strategically located holiday resorts in the region of Cabanas de Tavira. Just 6 km from the Tavira town, the hotel is close to the beach. There are golf courses, the fortress at Cacela Velha and quaint villages nearby, and the Rio Formosa Nature Reserve is ideal for walking, sightseeing, cycling, bird watching and canoeing. Faro International Airport (42 km) is the nearest airport, just 20 minutes’ drive from the hotel. Accommodation at the Golden Club Cabanas comes in 2 categories – Sunrise Studios and Sunset Apartments. The studios accommodate 2 adults while the one- and two-bedroom apartments can sleep up to 4 adults. Both these variants feature private bathrooms, a kitchenette and a balcony. The rooms are well equipped with a satellite TV, a telephone, a microwave, a fridge, a dishwasher, a coffeemaker and a hob. A couple of other rooms also facilitate air conditioning. All the self-catering accommodation options offer views of the sea, river, hills or the garden. The main on-site restaurant, Amarelo, serves authentic Portuguese and Mediterranean specialities in buffet style. You can have breakfast between 8 am and 11 am while the lunch buffet is served from 12:30 pm to 2 pm. Dinner, buffet and themed most of the times, is served between 7 pm and 9 pm. At the lobby bar A Barca, you can savour exquisite cocktails. It has 3 areas: an indoor terrace, the more private Coral Room and the outdoor garden area. The À Vela pool bar runs only during the summers and serves light snacks and drinks. The Golden Club Cabanas provides a variety of leisure and entertainment options that cater to the need of all age groups. There are multi sports game court where you can play games like basketball. There’s also a beach volleyball court and exercise rooms. The hotel facilitates golfing at a nearby golf courses. Outdoorsy travellers can go hiking around in the Rio Formosa Nature Reserve or head to picturesque villages like Cacela Velha. At the hotel, you can make a splash in the 2 outdoor swimming pools or the indoor heated pool with Jacuzzi, sauna or steam bath. The 7 km-long golden sandy beach in front of the hotel is a perfect place to soak in the sun. 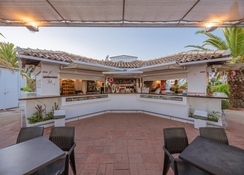 Young guests can enjoy at the children’s club that arranges loads of games and activities, while adults can look forward to the evening entertainment programme that organises live music, shows, dancing, games and quizzes. Had a really nice time. Everything we needed was here. Food could have been better, but still found a choice of something to eat. Lovely and clean. No back ground music at all. Bar staff rude. Location was ex, same as the pools. Lots of mosquitoes. But we would go back. If they make a few changes. This is the third time we have been to The Golden Club and it just gets better the staff are excellent the place for a two star definetely punches above its weight the location is great and we have found our little paradise. The room itself wasn't that bad, but the bathroom could have really been much better. The tub was simply not acceptable (old and awful). Boat shuttle to the beach operated until 5pm, so no chance to get there later. Shame!